I have finally received the all-clear to start cycling. So, in true 2wheelchick spirit I got straight back on my two-wheeled horse. Admittedly they have been shaky beginnings, but in any case I am just glad to have been able to get my bike out of the garage and give it a spin. It was a lovely feeling to be sitting on the saddle and rolling along, albeit slowly! My first ride was last Sunday week. Ironically the sun had been shining all morning, and the weather was set fair for the afternoon, according to BBC Weather. However, the moment I stepped out of the house and began to pedal the sky suddenly turned dark grey and spots of rain began to fall. Within 10 minutes we had gone from bright sunshine to grim hailstones! A bad omen? "This wasn't part of the plan!" I said to myself. "Bloody typical!" In all my annoyance I adopted a defiant attitude, and was determined to continue with my plan to get to Richmond Park. It may not be the most pleasant comeback ride, but the importance was getting out and doing it. So off I trundled. In fact, in the battle of wills it was one nil to me, for the rain soon subsided and within a quarter of an hour we had sunshine again. A bonus! My ride through South-west London turned out to enjoyable in the end. One thing I like about my cycle rides in London is the fact that you can ride through suburban built-up areas and it is still perfectly agreeable. We are privileged to have a lot of green spaces. From South Norwood lakes, Streatham Common, Tooting Bec Common, Wandsworth Common, Putney Heath, I feel blessed to live in a big city that still has plenty of green spaces. I know people bemoan the fact that London has less greenery than it had 20 or 30 years ago, but really I think we do well compared with other European cities. 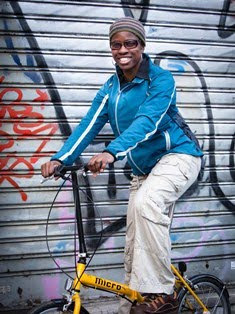 Riding around central Milan when I worked there was flat and compact, but it was not picturesque at all. The ride out to pleasant cycling areas like Brianza or Como involved a 20-mile dismal trudge past a collage of industrial estates and disused factories! By contrast my urban ride to Richmond Park was quite a joy. Needless to say once in this royal park I found it a delight to be there among the various other park users enjoying outdoor life - including the deer. For a first ride I had coped ok. However, it had been a shock to the system even just to ride up a very gentle incline that went over the railway line near me. I felt rather self-conscious going at a snail's pace over the slightest slope and holding up all the traffic behind me! It reminded me of my trip to Peru when I landed in Cusco only to struggle with the altitude. While I had to rest in between every step I took, 70-year-old Peruvians with packs on their backs were skipping past me effortlessly. Today I felt the same embarrassment as I felt back then. This was just a less exotic setting! Naturally, once in Richmond Park the idea of riding all the way up to Richmond Gate and Pembroke Lodge was completely out of the question, so I stuck to riding the small loop that took me past the Royal Ballet School and Pen Ponds Car Park. There was just enough time for me to get a quick snack at Pen Ponds and then head back to Clapham Junction to get the train home before dusk. Normally I would have ridden home, but given that my computer was showing 20 miles of riding for the day I thought it better to stop before I do myself some damage through "overtraining". I slept well when I got home! My second ride was a couple of days ago, and this time it was out to the more rural setting of the Kent Weald. Being in Crystal Palace means having a few options - the chance of getting into Central London within a comfortable distance, but also the facility to get into the countryside and quiet lanes. Sunday's ride took me past the increasingly used Biggin Hill Airport, with its attractive display of civilian and Royal Air Force aircraft, then I dropped down through Westerham and along the Pilgrims Way, passing a number of quaint English villages to reach Sevenoaks, and my ultimate destination - Knole Park. Where the previous Sunday's ride had included one significant hill around Wimbledon Park, this second ride was peppered with hills and long uphill drags. I was significantly challenged on the long climb up through Keston, and then later on when riding through Sevenoaks. In fact through absentmindedness I overshot the turning into Knole Park and ended up doing an extra mile of uphill, nearly ending up in Tonbridge! Although this ride was slightly longer and much hillier than the previous week I had coped better and already felt stronger. This ride, although only 25 miles still left me pretty pooped at the end of the day - particularly as my body had also been working hard to stay warm in these winter temperatures we've been having. 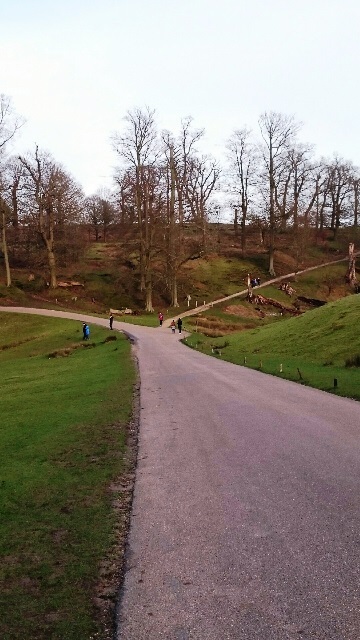 Knole Park is worth a visit. Like Richmond, it is set in wild, vast, unspoiled parkland with its share of deer as well as a stately home with ornate courtyard (and of course a tea room) to visit. So, after two varied rides I am beginning to feel like a cyclist again. In a week's time I should be able to take on the daily cycle commute to work - once I have conquered the mighty hills of Crystal Palace! Richmond Park - Britain's cycling Mecca! 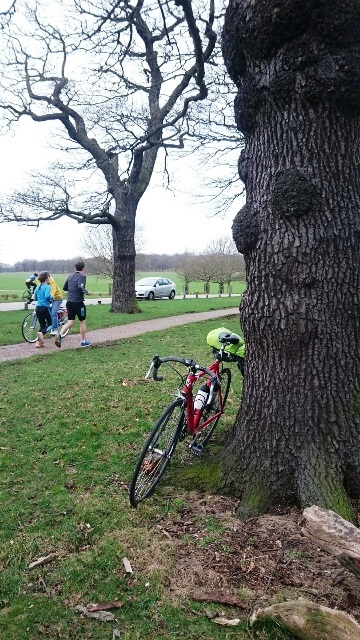 Enjoyed reading your report of riding to and around Richmond Park. I live in Sutton and RP is one of my favourite rides. The off-road circuit around the park is really lovely with a tea stop at Pembroke Lodge an added bonus. Thanks PTP. I think I will go off-road the next time I'm in Richmond Park. I agree the area around Pembroke Lodge is lovely. Hope to be fit enough to get up there next time!